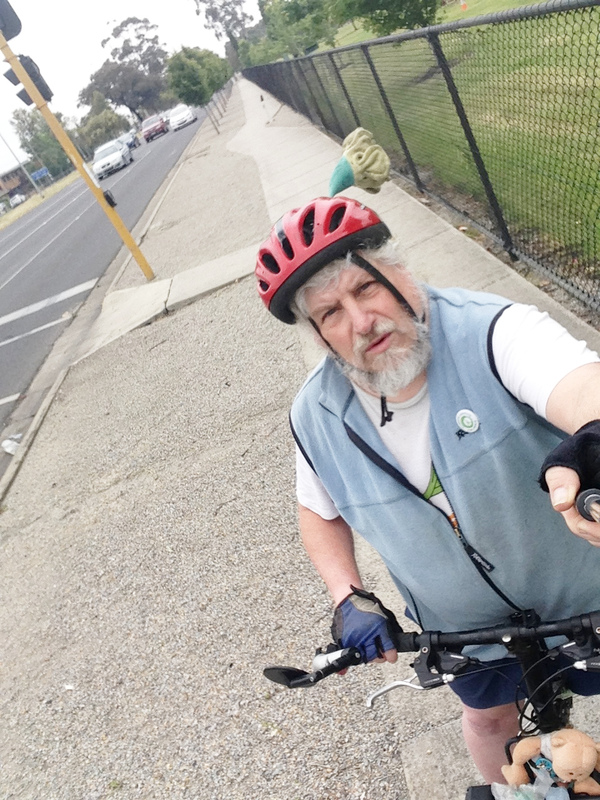 One of the anomalies facing cyclists accessing the Upfield Bike Path from central Fawkner was either using Sydney Road in a 70km zone or riding on the footpath next to the cemetery, an illegal act unless accompanying children. We have just heard from our new Councillor Ali Irfanli (Facebook) that the footpath along Sydney Rd near the cemetery will be re-designated a shared path between Lorne St and Lynch Rd. It will be signposted as such in the next 4 – 6 weeks. The costs of these works has been assessed as minor and is managed within the existing Council budget. While we appreciate this change, it does not go nearly far enough to resolving an anomalous legal and safety issue for Fawkner cyclists. The issue of open space and Montfort Park in Brunswick has been raised by the initiation of a community petition and Facebook Group. Although I live in Fawkner, I care about open space and environmental issues across the municipality. This is also a park that I used to use so there is a personal connection. 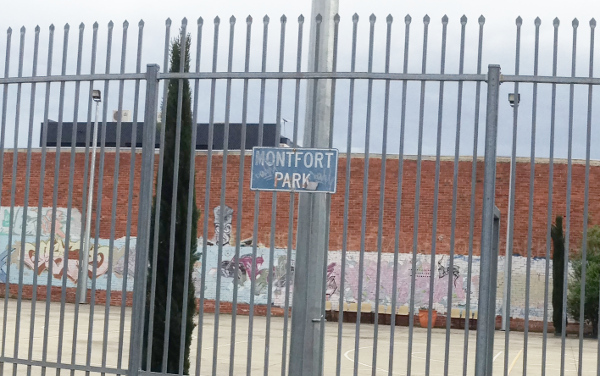 Montfort Park is at the corner of Henkel St and Wendel St in Brunswick. The park, and the old scout hall next to it, were sold to a community group by Council in 2003, but with conditions on the use of the open space land, that it’s title of Montfort Park continue and that the park and it’s facilities be developed as a basketball court or similar and remain accessible to the public. It is now all concrete, a basketball court and open space, and surrounded by a 3 metre steel fence. Local residents argue it is seldom used and remains inaccessible for public use. The election was held Saturday 22 October. See the election results. I decided to broaden my matrix on survey engagement to all candidates across the municipality. This is a relatively neutral way to assess engagement by candidates with community groups on issues, while leaving the content of their responses up to voters to investigate. Surveys conducted by community groups included: Climate Action Moreland on climate change, sustainability and climate emergency; Moreland BUG on cycling; Bicycle Network; Pentridge Community Action Group on Pentridge Development (NE ward only); Music Victoria on support for local live music; and Alliance for Gambling Reform on Pokies reform. I have put together this matrix so you can see at a glance who responded to each survey. Candidates are listed in the order they appear on the ballot paper. Current Councillors re-contesting having an asterisk in front of their name. 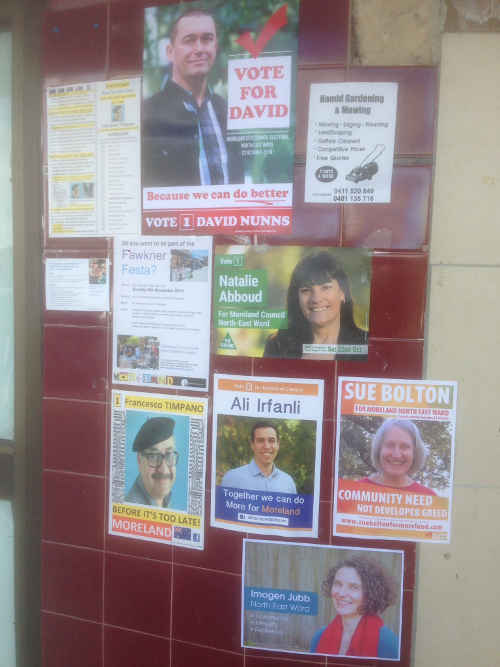 Who is standing for NE ward of Moreland Council in 2016? For Moreland Council North East ward, which Fawkner is a part of, 4 Councillors are to be elected, from 20 candidates standing. See VEC Moreland City Council 2016 Nominations. The following is the list of candidates as they will appear on the ballot paper. Climate Action Moreland have done a simple survey of candidates on climate and sustainability policies which are worth checking out. Two candidate forums have been organised so far for North East Ward. The election is on Saturday 22 October. See the election results. 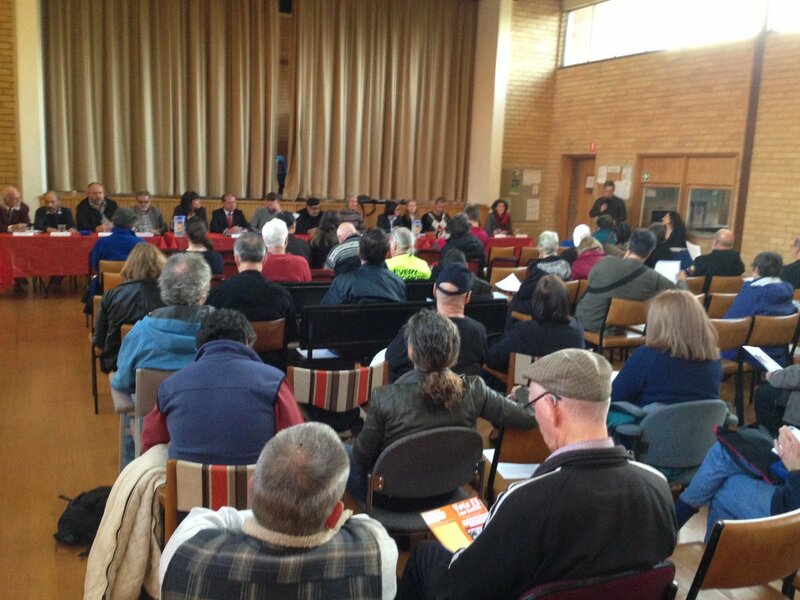 Pentridge Community Action Group reported: “Show of Hands from Candidates present at the Moreland Council NE Ward Forum re question posed by Prof Hamel-Green on opposing > 4 storey development in the Pentridge Precinct. Candidates with hands raised are George Georgiou, Sue Bolton, David Nunns, Antonio Bonifazio, and Imogen Jubb. A late response was made by Francesco Timpano”. A third candidates forum organised at Merlynston. 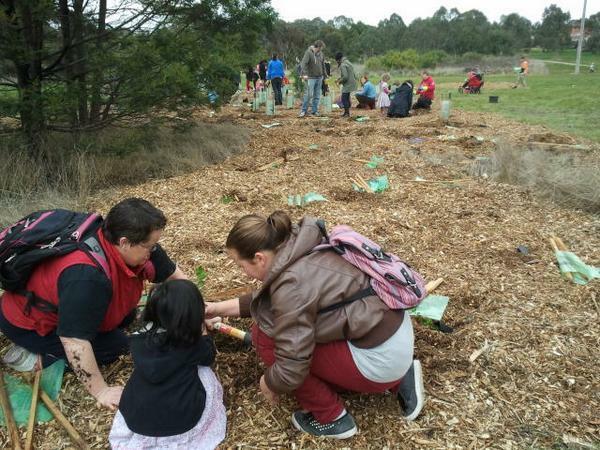 Merri Creek Management Committee and Friends of Merri Creek are holding a planting event at the end of Jukes Rd, near Merri Creek this weekend. Much of the creek vegetation has been assisted by regular plantings over the last 50 years to restore a semblance of native habitat along the creek corridor. You are invited to join this ‘Habitat Heroes’ planting on Sunday 23rd August. 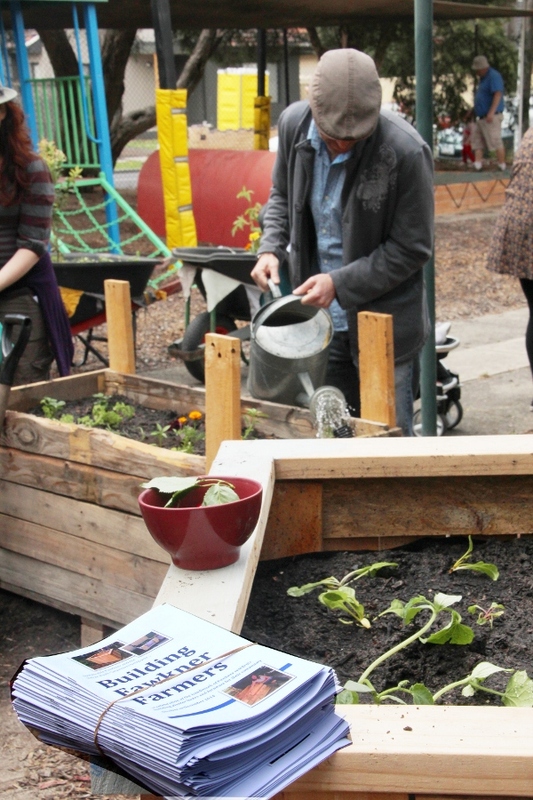 Featuring planting, Wurundjeri Elder Caring for Country presentation, guided bird watch, self-guided walks to learn about 10 top plants for providing habitat, and BBQ. These planting events are a lot of fun to do together. Bring kids along to help too. For enquiries phone Ray or Monica at MCMC on 9380 8199 or 0421 683 926 on the day. The plantings are Funded by the Helen Macpherson Smith Trust and the State Government’s Communities for Nature. 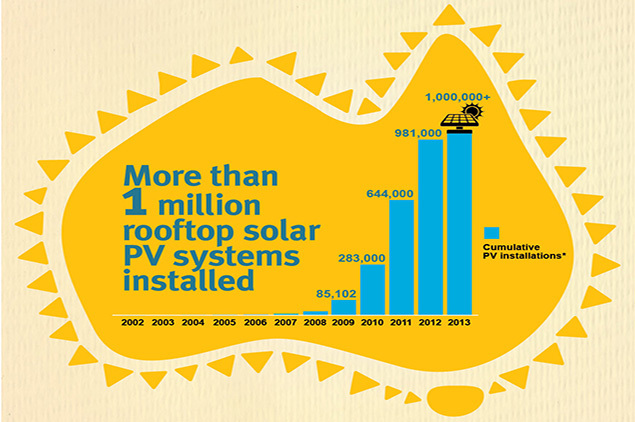 Supported by Moreland City Council. This story is a little different from my usual fare. It is about a major Health company – Healthscope – launching a campaign against local residents and Moreland Council for the redevelopment of the John Fawkner private hospital. If you live in Fawkner, or elsewhere in Moreland, you may have been surprised to see a letter sent to your address in your letterbox from John Fawkner Hospital yesterday or today. So why would John Fawkner Hospital, located on Moreland Road in Coburg and bordering Brunswick be sending these letters out to distant parts of the municipality like Fawkner? Perhaps they have done a mailing to every address in the municipality? I don’t know. So this letter explains that they want to redevelop and expand the site including building a multi-level car park. But their development plans have gone to Moreland Council and twice been rejected. Something fishy is going on here. The first time the plans were rejected by Council in July 2012 as inappropriate. John Fawkner Hospital appealed the decision to the Victorian Civil and Administrative Tribunal (VCAT) but lost. Strange, because usually VCAT decisions predominantly support development proposals. Moreland Energy Foundation in conjunction with Moreland City Council are holding a forum for residents, community groups and businesses to discuss and network on environmental sustainability issues, to make a greener Moreland. It is a chance to catch up with the many groups and individuals across the municipality working on sustainability from many different angles. 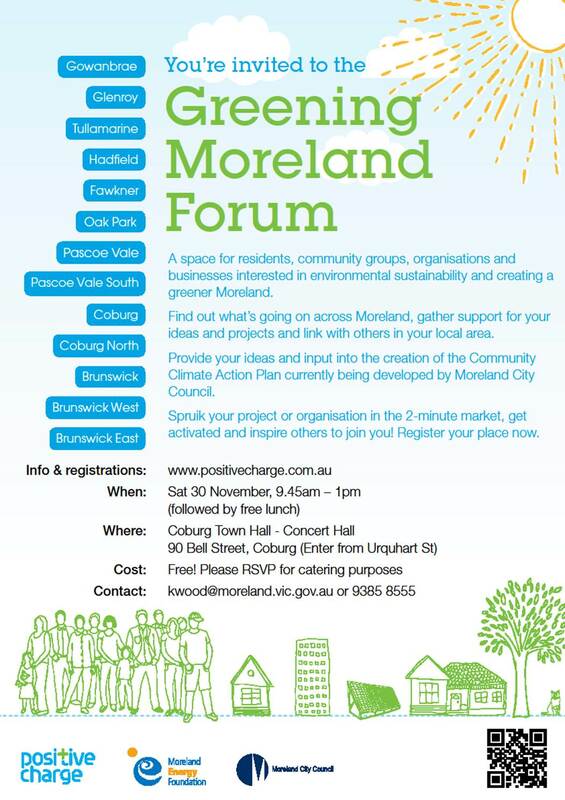 The event will also provide an opportunity for ideas and input into the creation of the Moreland Community Climate Action Plan being developed by Moreland Council. An introductory session will use a 2 minute market process, allowing every person an opportunity in turn to speak uninterrupted and explain what they or their organisation are doing regarding environmental or sustainability activities, or areas they are interested in working in. Lunch: Lunch Food provided free after the forum. 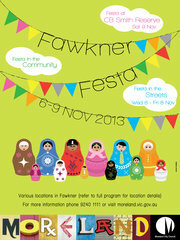 Sustainability Fawkner have our regular Food swap on the Saturday 9 November from 10.30am to 12.30pm in CB Smith Reserve. Come along early with your garden produce to swap and stay and join the rest of the festivities for the afternoon.